We’ve shared many blogs and technical papers in the past about moisture vapor issues, yet we still find that many people don’t fully understand the issue and why it’s become much more prevalent in the last 30 to 35 years. Understanding moisture vapor transmission and concrete slabs on grade requires knowledge of how the concrete was placed. Closed Concrete System requires the concrete to be placed directly on an intact moisture barrier. A Closed System means that the amount of moisture available should be limited to what is in the original concrete mixture. Open Concrete System refers to concrete that is placed directly on the subsoil or directly on engineered fill. This also means the amount of moisture available to the concrete from below may be infinite. Note: Understanding hydrostatic problems is different than osmotic moisture problems and hydrostatic moisture problems are not addressed in this blog. An important thing to remember about moisture vapor is that it’s an unpredictable, dynamic issue. Moisture vapor is driven by several factors, most notably by it’s desire to move from areas where it is to areas where it is not, thereby reaching an equilibrium within its environment. The moisture drive is closely related to the difference between the temperature at the bottom of the slab and top of the concrete slab. That is why a build’s HVAC system must be working and the building must be acclimatized to within 5 +/- degrees Fahrenheit of its operating temperature before testing for moisture and before placement of moisture-sensitive coatings and flooring systems. As one can imagine, the different weather patterns and environments have a tremendous effect on moisture vapor drive. Even in areas that are considered a desert climate, the water table rises and lowers, which affects Open Concrete Systems negatively. 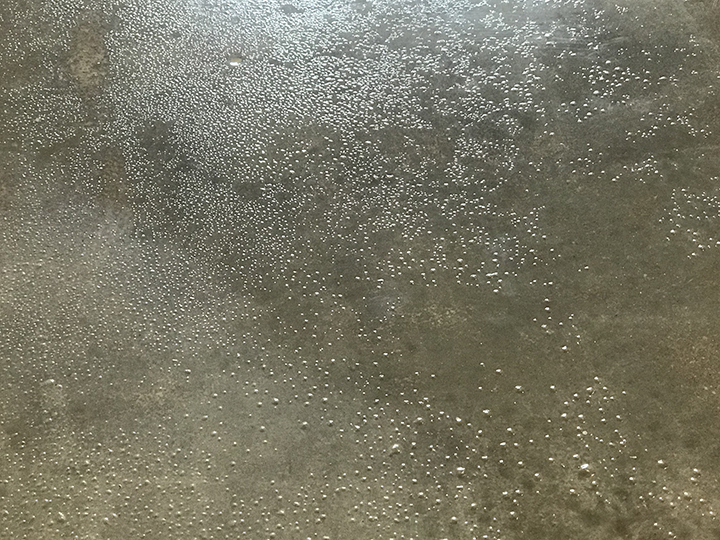 All that being said, it is imperative to understand that the moisture in itself isn’t the only culprit that can cause blistering of floor coatings and debonding of adhesive adhered flooring systems. Rather, it is the alkalinity we must worry about, which hitches a ride with the moisture vapor that is brought to the surface of the concrete slab. Freshly laid concrete can have extremely high levels of pH at the surface of the concrete slab due to its composition; most notably calcium hydroxide, potassium hydroxide and sodium hydroxide, which have pH levels of 12.5, 13 and 14 respectively. To understand how high that is, consider that distilled water is a 7 (or neutral) on the pH scale, which runs from 0 to 14. Everything below 7 is acidic; everything above is basic. It is also important to understand that the scale is logarithmic, which basically means increasing one number is a tenfold increase in strength. So, if we compare sodium hydroxide’s pH of 14 is alkaline while distilled water has a pH of 7, it has 10 million times the strength! It’s also crucial to remember that if you don’t have moisture vapor issues you seldom have alkalinity issues because you must have a solution, which in this case is water. What Has Contributed to More Flooring Failures? Many people believe that it was the advent of the EPA reducing Volatile Organic Compounds (VOC) that led to the increase of coating and flooring system failures due to osmotic blisters, which is partially true. Adhesives transitioned from the more alkaline-resistant, solvent-based formulas to water-based formulas. The other culprit was the preference for shot-blasting concrete to achieve a specific profile for a physical bond and to remove existing adhesives and cement carbonation on the surface. This also opened more pores in the concrete slab than other methods of surface preparation, thus a greater amount of moisture and water-born alkalinity could become present at the bond-line, leading to moisture blistering. Contrary to popular belief, moisture related issues are not only a concrete slab on grade issue. It is common in today’s lightning fast construction cycle to want to get on an elevated slab as fast as possible. In addition, the concrete is usually placed over a corrugated steel deck pan that is left in place, only allowing for one-sided drying. Many people incorrectly believe that concrete only needs 28 days of curing before it’s ready. However, in 2005, ACI 302.2R Guide for Concrete Slabs that Receive Moisture-Sensitive Flooring Materials dismissed the old adage of a 28-day cure as meaningless and further clarified the water/cement ratio and the duration of time needed for “one side drying” when tested per ASTM F1869 (commonly referred to as a calcium chloride test). As an example, if the water/cement ratio is 0.5, and the concrete is placed on a positive side moisture barrier and moisture cured, it will take on average 199 days to reach 3 pounds. At a water/cement ratio 0.6, and the concrete is placed on a positive side moisture barrier and moisture cured, it will take an average of more than 365 days to reach 3 pounds. A simpler rule of thumb has always said one month per inch, but this of course is only an approximation and will depend on ambient conditions and will still require moisture testing to verify a floor is ready to be covered. What’s worse is that if we assume a specified water-to-cement ratio of 0.5, we only need 12 gallons per cubic yard to hydrate our cement, or 35% of the 34 gallons per cubic yard that is added to the mixture. In this example, the additional water or 65% of water that is added is purely water of convenience to make it easier to place. That means 22 gallons per cubic yard must evaporate out of our slab! Fortunately, Super-Krete® Products offers easy-to-apply products that can help mitigate these problems. Contact your sales rep or our technical services department with any questions. Good luck and good selling. Here you will be able to find a distributor from the available states. Love our products? Want to offer high-performance flooring solutions to your customers? Get Started. Let us know about your recent customer experience. Get the latest product news, installation techniques and inspiration.